Maharashtrian brides are clad in innumerable elements on their wedding day. Be it their authentic accessories or their pop-hued saree, their wedding attire is quite interesting and unique. In order to ace this look, makeup skills also play a very important role. Though a Maharashtrian bride is visibly different in terms of the trousseau, her makeup is also quite unique as compared to other brides. On the D-Day, most Maharashtrian brides wear a traditional yellow saree and the makeup should complement the attire. 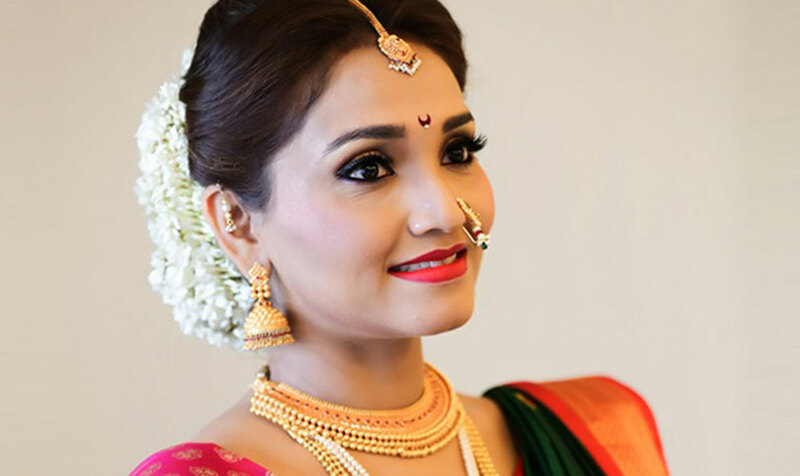 Here are some important things to keep in mind for Maharashtrian bridal makeup. The main highlight for a Maharashtrian bride is her pink glowing cheeks. When going for a Maharashtrian bridal makeup it is necessary to pay attention to the cheeks and opt for the right blush. Make sure the blush is applied correctly and is not looking cakey on the face. Typically, Maharashtrian brides have a loud makeup to complement their colourful attire and accessories. The eye makeup on the wedding day is loud and dramatic. It is best to opt for a subtle eyeshadow so that the kohl pencil and the eyeliner make an impact. In order to add drama, lips are of utmost importance. Choose from the bold lip colours which highlight the lips to the fullest. However, make sure that the lip colour suits the eyeshadow too. If you want to tone down the look, opt for a lighter lip shade. Follow these tips and you are definitely going to love your Maharashtrian bridal look!